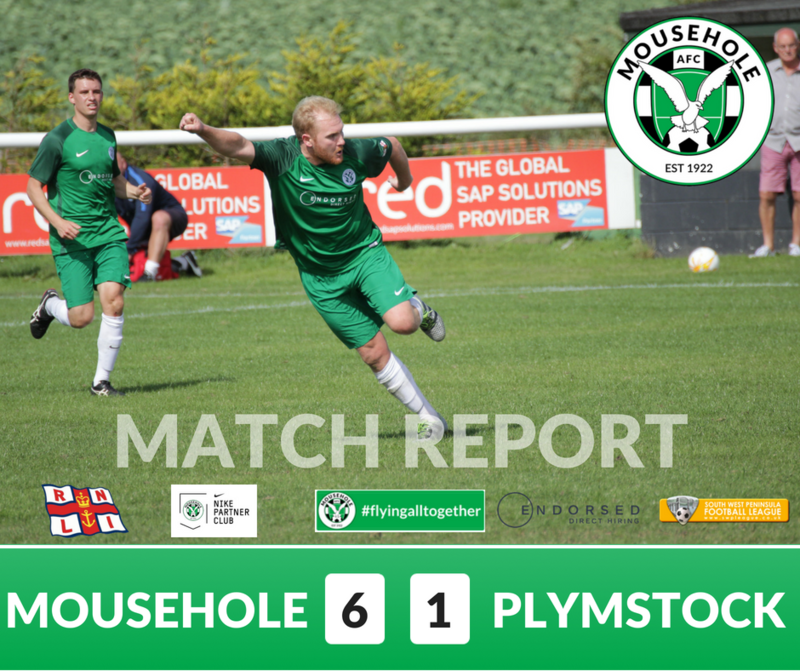 It was a day of celebration at a sunny Trungle Parc on Saturday as over 100 spectators saw a dominant Mousehole signal their intentions with a comprehensive and entertaining 6-1 victory over their Plymouth-based visitors. This is the season in which The Seagulls, as one of a handful of Division One clubs currently without floodlights, need to get as many points as possible to qualify for the few available promotion places in next year’s re-organised Step 6 League. With several new faces in the team line-up, the hosts continued with their passing style of play from last season and had already come close to opening the score several times in the opening period when the inevitable goal arrived in the 13th minute as last year’s top scorer Jake Andrew side-footed home from 8 yards after an incisive move on the left and a dangerous low ball into the middle. Three minutes later new signing Gerens James, returning to the club where it all began, opened his account from close range after another cross caused havoc in the Plymstock defence. And to complete a quick-fire three-goal salvo in five minutes, player-manager Calum Elliot latched on to a Steven Ziboth lay-off to hammer a superb swerving 25-yard drive into the top corner. The visitors were rarely allowed to venture forward with any purpose as Mousehole kept possession and moved the ball all over the pitch with varied passing, but on one promising occasion they hit the post from a corner mid-way through the half. Meanwhile, goalkeeper Luke Fletcher was Plymstock’s busiest player, standing in the way of several attempts to increase the score. The shot-stopper thwarted Steven Ziboth in a one-on-one chance shortly after the break, but then left back Jack Lee unexpectedly gave his side some hope as he came up from defence to score with a low 15-yard shot that crept in off the far post in the 49th minute. Normal service was restored five minutes later as Steven Ziboth, providing constant menace with his direct running at pace, won and converted a penalty to make it 4-1, and Calum Elliot followed it up with a fifth goal after 57 minutes with a well-placed shot inside the near post from a Paulo Sousa cross after being set up by Ziboth. After further near misses by the home side, Mousehole goalkeeper Sam Shulberg was suddenly called into action with a point-blank save in the 69th minute. But a minute later it was 6-1, Gerens James grabbing his second goal as he raced in to prod home yet another Ziboth cross, and the marksman was very close to a hat-trick on 73 as Fletcher parried his header, with another new signing Ryan Andrew firing the rebound over the bar. In the last significant action of the game the influential Sousa-Ziboth partnership on the left almost produced a 7th goal, with Fletcher pushing out Ziboth’s 25-yard shot for a corner. The Seagulls’ second league game is the short away trip to Wendron United tomorrow (Tuesday 21st) with a 6.30pm kick off. On Saturday Wendron were the team left without a fixture in this year’s 15-team Division, so tomorrow’s will be their first match of the season. Mousehole are the odd-ones-out this coming weekend but return to Trungle Parc on Tuesday 28th for a local derby against neighbours Ludgvan (6.30pm). Sam Shulberg, Billy Curtis (captain), Liam Andrew, Jean Bavangila, Paulo Sousa, Ryan Andrew, Max Hill, Calum Elliot, Jake Andrew, Gerens James, Steven Ziboth. Substitutes: Craig Wilcox (for Gerens James, 74), Tom Hands (for Calum Elliot, 74), Chris Bullock (for Jake Andrew, 80), Tom Patrick. Mousehole scorers: Jake Andrew (13), Gerens James (16), Calum Elliot (17), Steven Ziboth (54, pen), Calum Elliot (57), Gerens James (70). Referee: Marc Rose. Attendance: 108.